Brachycephalics are patients that are prone to the increase in the superior airways’ resistance, with the decrease of the airflow at the level of the nose or mouth, which implies higher risks and complications associated with anaesthesia. 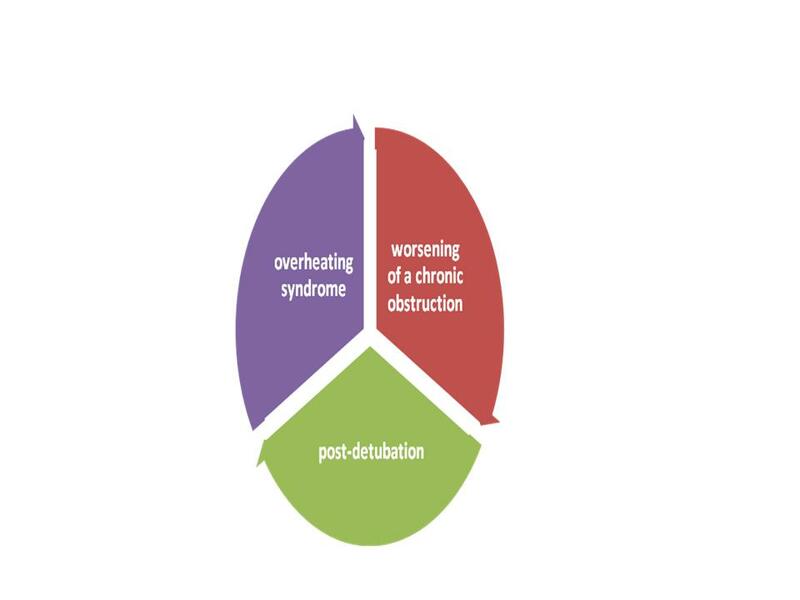 The acute obstruction of the superior airways can manifest itself consequently to the overheating syndrome (excessive heat, excessive humidity, after physical effort, hyperthermia), post-detubation or as the worsening of a chronic obstruction. The overheating syndrome is represented by the the body’s incapacity to dissipate the accumulated heat and can manifest clinically through hyperthermia (> 41° C), dysfunctions of the central nervous system, the activation of the inflammatory mechanisms, hemostasis disorders and initiation of the systemic inflammatory response syndrome (SIRS). The physiopathological cascade can evolve through multiple organ dysfunction syndrome (MODS), acute respiratory distress syndrome (ARDS), acute kidney injury (AKI), disseminated intravascular coagulation (DIC). 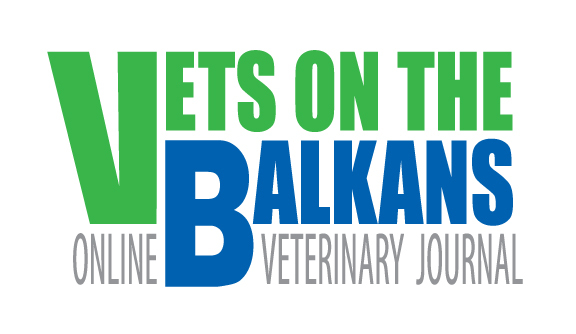 The risk factors for the triggering of the overheating syndrome are represented by any anterior episodes, obesity, breed (brachycephalics, Golden Retriever, Labrador), elevated ambiental temperatures and humidity, poor acclimatization, low resistance to physical effort. Hyperthermia can generate cerebral hypoperfusion, neuronal necrosis, vascular lesions, cerebral edema, haemorrhages, multifocal vascular thromboses. The clinical signs can be spontaneous haemorrhages (petechiae, hematemesis, hematochezia).DIC can appear anytime during the first 24 hours after the incident (close monitoring). Hyperthermia can trigger oxidative stress mechanisms, which can act at gastrointestinal level through intestinal ischemia, cytoskeleton relaxation, increase in intestinal permeability and finally, bacterial translocation. Temperature control is essential for the limitation of clinical manifestations (tachypnea, tachycardia, vasodilation, massive haemorrhagic diarrhea and hematemesis coagulopathies, miocardial hypoperfusion, lactic acidosis, electrolitic disturbances, cardiac arrhythmias, stupor, convulsions, exitus). 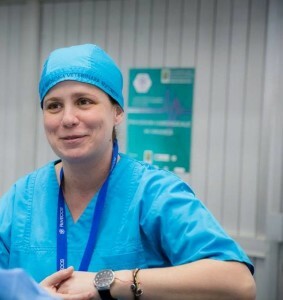 The patient will have to be cooled simultaneously with the administration of fluids for the control of tissular perfusion and hydroelectrolytic disorders. 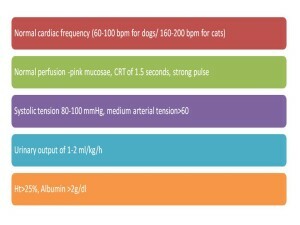 Crystalloid isotonic fluids will be administered, supplementing, if needed, with colloid boluses, depending on the hydration state, cardiovascular potential and the electrolytic status of the patient. The therapy will continue without interruptions until the patient is stable. In severe cases, it is necessary to start the antimicrobial therapy for restricting the endotoxemia and preventing sepsis ( broad-spectrum antibiotics). The therapy will be completed with gastrointestinal protectors, H2 antagonists (famotidine) and proton pump inhibitors (pantoprazole). Continuous monitoring throughout the therapy is mandatory, because the patients need re-evaluation and consequent adaptation of the therapy. 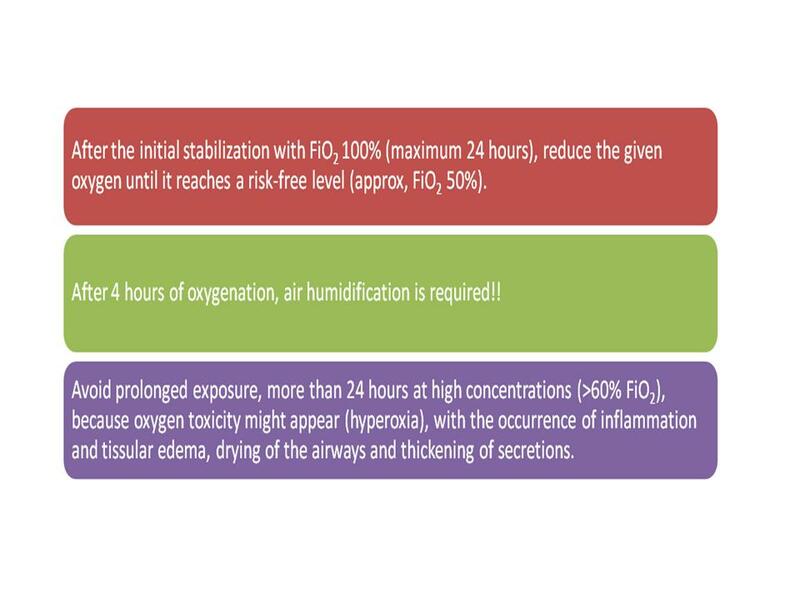 Oxygen supplementation is necessary when the patient first shows up ( starting with the triage phase) in the case of acute respiratory distress syndrome (ARDS), noncardiogenic pulmonary edema or laryngeal edema. Brachycephalics in thermal shock exhibit compensatory hyperventilation or can’t oxygenate themselves enough, consequently to respiratory insufficiency, with high respiratory effort, hyperthermia, muscular exhaustion and, finally, respiratory arrest! The immediate control of hypoxemia initially requires oxygenation through noninvasive methods, followed, if needed, by additional invasive procedures (general anaesthesia with endotracheal intubation, nasal oxygenation catheter, tracheal catheter, tracheotomy/ tracheostomy). 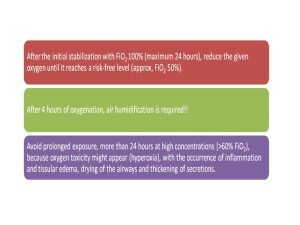 High air flow devices can be used for oxygenation (>15l /min. )- oxygen tent/cage, AMBU-bag or low flow devices(<6l/min. 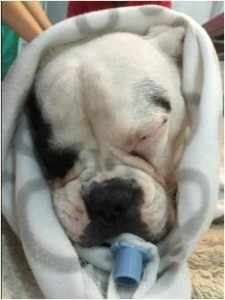 )-mask, nasal oxygenation tube, endotracheal probe, tracheal catheter. Assisted ventilation is recommended either in case of hypercapnia (PaC O2 >60 mmHg) or severe hypoxemia (PaC O2 <80 mmHg or SpO2 <90%) with persistent cyanosis despite having oxygenation levels reaching 100%.Possible complications regarding mechanic ventilation are correlated to the accidental disconnection of the patient, device failures, barotrauma, atelectasis or oxygen toxicity. Brachycephalics are NOT the best candidates for „a simple sedation”, requiring, in most cases, general anaesthesia protocols. Given the fact that all anaesthetics affect the respiratory function through central depression or through muscle relaxation, a continuous monitoring is necessary, from premedication to the patient waking up from anaesthesia. Preanaesthetic evaluation will be cautiosly approached, in order to reduce the perioperative mortality, by tracing and evaluating the risks and by adjusting the perioperative protocols. The patients will be premedicated in order to reduce stress, anxiety, agitation, this also leading to a decrease of the doses that are necessary for maintenance. For critical patients, premedication can be excluded, but analgesia must be maintained! A minimal contention is recommended, without a muzzle! For brachycephalics, preoperative preoxygenation is mandatory. For induction, the lowest propofol doses will be slowly administered intravenously. (1.0 mg/kg slowly injected intravenously for the first 15 seconds, then another 1.5-2 mg/kg until reaching the desired effect). The administration of propofol in rapid bolus causes apnea, bradycardia, hypotension and respiratory depression. Propofol reduces the cerebral metabolism, the cerebral blood flow and the intracranial pressure, also alleviating the effects of the hypoxic lesions, and inhibiting lipid peroxidation, having an antioxidative action. The endotracheal intubation of the brachycephalics must be done with care. 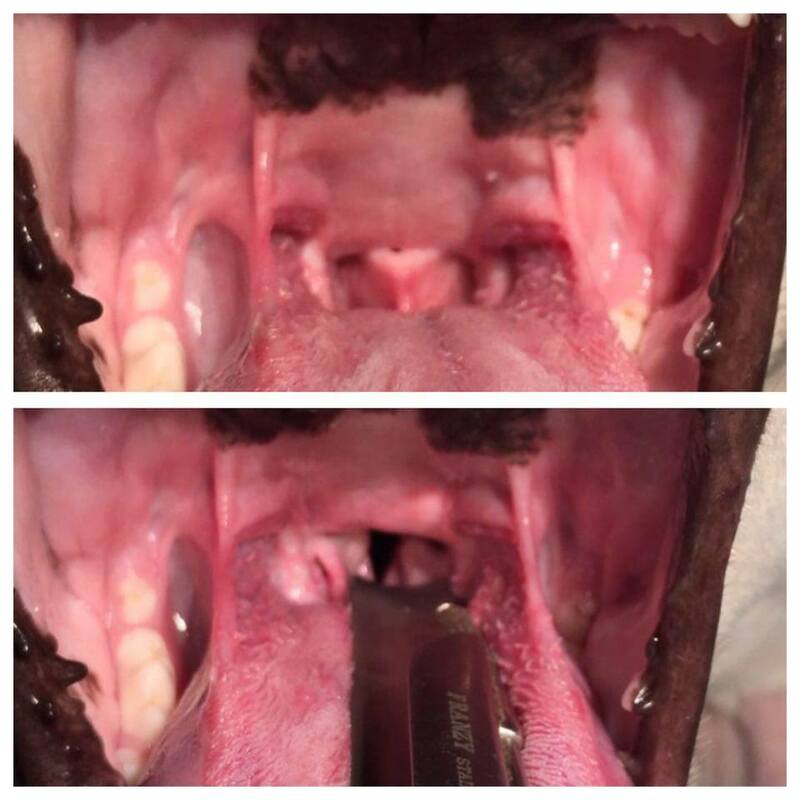 It is hard to anticipate the dimension of the trachea by the size of the patients, because they often have hypoplastic tracheas. Anaesthesia is maintained gaseously, ensuring the efficient ventilation of the patient. For avoiding regurgitation, the patients will be positioned slighly forward, with the anterior extremity lifted at . Inhalation anaesthesia protocols can be carried out, if needed, at the same time with the administration of opioids (bolus or CRI) or with locoregional anaesthesia techniques (blockages, infiltrations, epidural etc.). Secondary effects can appear at high doses of opioids (dysphoria, bradycardia, respiratory depression). For ensuring the polymodal analgesia, opioids, NSAIDs and local anaesthetics can be administred. Managing the hemostasis disturbances implies the stabilization of the coagulation system, the administration of fresh frozen plasma or anticoagulants, for preventing thromboses. Maintaining the renal function is possible in the case of patients suffering from thermal shock through maintaining the perfusion and oxygenation of the kidney. 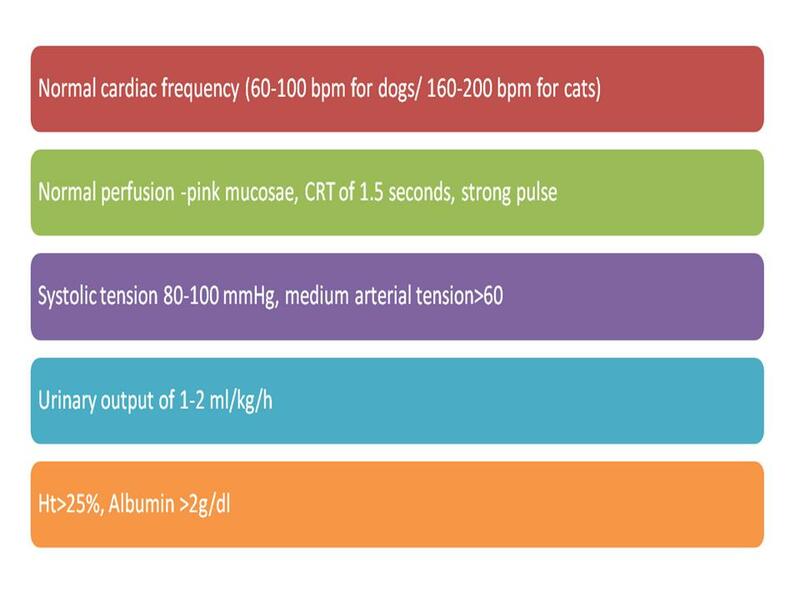 Hypovolemia and dehydration will determine the arterial tension and the cardiac output to lower, leading to the decrease of the renal perfusion ( renal ischemia). Lowering the oxygenation at renal level will favor the triggering of acute renal insufficiency. Consequent rhabdomyolysis and myoglobulinemia will damage the kidney even more. If the urine output is low (<1ml/kg/h) even after fluidotherapy, furosemide and/or mannitol can be administered. Mannitol (osmotic diuretic) will reduce the water content of the neuronal cells, will increase the reanl perfusion and diuresis. Furosemide can be administered at 15 minutes after the administration of mannitol. An option for hyperhydration, uremia or different electrolytic imbalances is represented by hemodialysis. Monitoring the glycemia is very important for critical patients, because the ones that are hypoglycemic have a hard time compensating! A particular situation is represented by the acute obstruction of the superior airways after detubation. 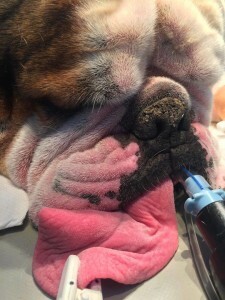 The muscles of the superior airways, which are relaxed post anaesthesia, can favor the appearance of acute obstructions at brachycephalic breeds, together with the inflammation of the larynx and the pharynx, especially after the specific correctional surgical procedures. That is the reason why it is recommended to postpone these patients’ extubation for as long as possible after anaesthesia and to supplement their oxygenation through noninvasive methods (nasal oxygenation probes, prongs, oxygen cage), until they have completely recovered from it. 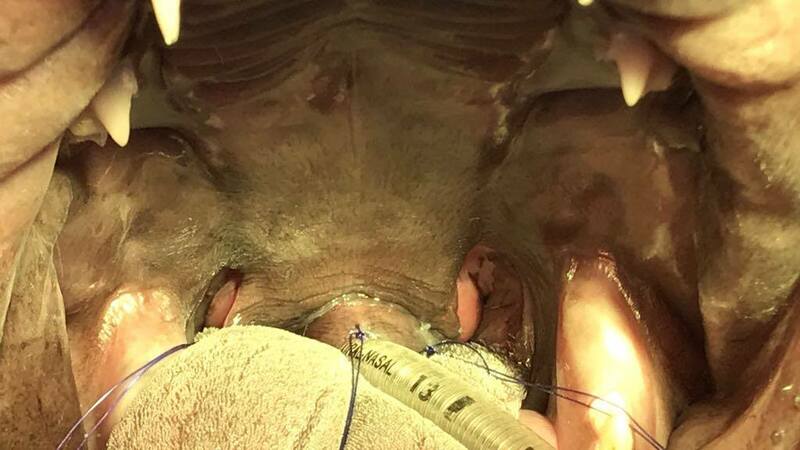 Since the risk of complications is high, it is good to be prepared for a possible reintubation or even for invasive oxygenation methods (trecheotomy, trecheostomy).